b) Call us at 228 19 01, 228 45 06 or 228 90 03.
c) Have a photo taken of the cars before moving them. If the accident takes place during working hours our expert will do it; if this is not possible draw a sketch of the accident. d) Before you come to us, make sure you have your insurance policy, driving license, identification and vehicle�s papers with you. 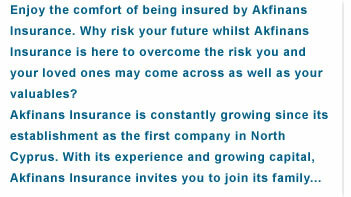 You can also inform us of any claim, accident and follow your case at akfinans@akfinans.com. 2. What should I do in case of a burglary/fire/personal accident etc.? c) In case of personal accidents please have your medical reports from your doctor/health institution ready before coming to our offices. d) In case of fire/burglary etc. have a photo taken of the site. If the accident takes place during working hours our expert will do it. e) Our expert(s) will examine the site before any reparation is started. 3. What happens if an alcoholic driver hits me? Law does not cover drivers who exceed the alcohol limit stated by the law. 4. What happens if the person that hits me drives away or does not have any insurance? In such cases, Mandatory Insurance Fund acts as the insurer and makes the necessary payment. On every policy, a certain amount is deducted from our customers that fill up this FUND for such cases. 5. When a thief breaks my window, does my THEFT policy cover this damage? No. If your house or work place�s windows, glass doors or glass displays are broken during burglary or any attempt to burglary, they will not be paid with THEFT insurance only. You need to have GLASS insurance coverage. This is also true for fire policies. If the glass windows or doors are broken in order to start a fire (not broken due to fire) Fire policy will not cover the damages. 7. When does an insurance policy start? a) An informative form is filled and submitted, either over internet, by fax or by visiting one of our offices, branches or agents. b) The informative form is examined and the site is seen if the request is for fire, theft, comprehensive car insurance and so on. c) A policy is written. d) Once the premium is paid the insurance starts. If the payment is agreed to be done with regular installments the coverage does not start untill the first installment is paid. The insurer always has the right to cancell any unpaid policy. 6. If I have a comprehensive car insurance, who pays an accident I cause? If the police find you guilty, then both the third party and your damages are covered with your insurance. If the third party is found guilty, then his/her policy is expected to pay for your damages. In case they refuse to do so, then we take on the responsibility to recover your losses and claim this amount from the third party�s insurance on your behalf. 8. Who else can drive my insured car? People who are eligible to drive and have your permission can drive your car under insurance coverage. Surplus charges or reductions are applied depending on restrictions and conditions of the driver(s). For professional purposes you need to have the person�s name stated on the insurance policy. 7. What is undervalued policy coverage? Let�s say you have a theft insurance policy for your house at 15.000.-YTL. The true value of your belongings is 50.000.-YTL. Then your policy coverage is undervalued by 70% (100- 15/50). In case of damages you get only 30% of your actual loss. It is always for your own interest to declare your belongings at their true value and insure them so, in order to get your full redemption.